Ready Player One is a breezy pop spectacle that tickles you with nostalgia. Based on the hit novel by Ernest Cline, the film pays homage to the classic favorites of the last forty years. It is entirely fitting that Steven Spielberg directs. He's the king of blockbusters, referencing his own work several times here. Ready Player One is a feel-good enterprise for sure. There's little meat on the bone outside the theatrics. You can't help but groove to Van Halen while our heroes race in Marty McFly's DeLorean. Set in 2045 Columbus, Ohio; the world is polluted, overpopulated, and poverty stricken. Humanity escapes their desperate surroundings as avatars in the OASIS, a virtual reality universe. The OASIS was built by a brilliant programmer, James Halliday (Mark Rylance). Upon his death several years earlier, it was revealed that Halliday hid an Easter Egg in the OASIS. Three quests, if found and beaten, would unlock three keys to the grand prize, total control of the OASIS. Tye Sheridan stars as Wade Watts, an orphan that lives with his aunt in "the stacks"; think mobile homes piled on each other like bad Jenga blocks. His avatar Parzival is a Gunter, someone trying to find the quests and unlock the Easter Egg. Wade has several virtual reality besties that help him search, none more important than Art3mis (Olivia Cooke). While Wade wants money to escape the stacks, Art3mis wants a revolution. An evil corporation, Innovative Online Industries (IOI), has dominated technology for the OASIS. Its CEO, Nolan Sorrento (Ben Mendelsohn), has an army searching for the Easter Egg. When Wade discovers the first key, he quickly learns that IOI is a threat in real life as well. Ready Player One is like a two hour serving of Frosted Flakes with every toy in the box. The pop culture references are hurled nonstop. Some are easy to spot and integral to the story, like the DeLorean. Others are sprinkled throughout, and like the primary Easter Egg, not so easily found. Half the fun of the film is recognizing what's what in the onslaught. 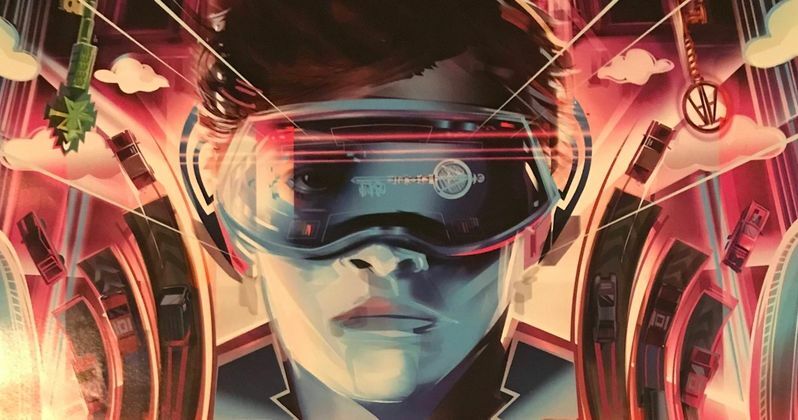 Ready Player One has a story and a message, but that plays second fiddle to the experience. I've never read the book, but Spielberg makes no effort to dig deep. He casually grazes the darker themes to keep the theme-park ride going. Ready Player One has a fairly large ensemble cast that we never explore. I can't even remember their names for this review. The character development is wafer thin, except for Halliday, the OASIS inventor. The characters have to explore his life in a sort of mental museum. This is where they discover the clues for the quests. Mark Rylance, a Spielberg favorite from Bridge of Spies and The BFG, is the standout as Halliday. His bad perm hairstyle and near autistic demeanor is a perfect puzzle to be explored. If only the script by Zak Penn and the author Ernest Cline had more depth. Wade, his cohorts, and the villains are one-note. I could have done with slightly less candy and more exposition. Most of the film takes place in the OASIS. You're essentially watching a ton of CGI. The OASIS is meant to, and does look like a video game. Some scenes are very cool and clever, while others don't quite measure up. They seem stale and less creative. The climax falls into this category. It's kind of a letdown when compared to the roaring adrenaline rush of the beginning. The third act is extremely busy with visual effects, but doesn't hit you as hard. It could be that the pop novelty has worn off by hour two. Fans of the book may find parts of Ready Player One lacking. There may be too much sweet and not enough sour. As stated, Spielberg is taking you on a pop joyride. He glosses over issues that I would surmise are covered sensibly in the novel. Why society escapes into the fantastical OASIS is not really explored. We see life in the stacks, a few glimpses at poverty, but no real journey into the brutal real world. This is a philosophical choice by Spielberg. He flirts with darkness, but never embraces it for this story. In that sense, Wade's adventure is sort of rote, even with the shiny bells and whistles. There's never any doubt to the hero's outcome. Ready Player One draws a wide demographic. Geezers like me to five year olds will find this film entertaining. The pop culture references are inherently amusing. Wade's choice of OASIS dance wear still has me smiling. Steven Spielberg and Warner Bros. bring levity and adventure to a dour box office. Ready Player One is certainly not a classic film. But does a hell of a job reminding you why the classics are so damn good.